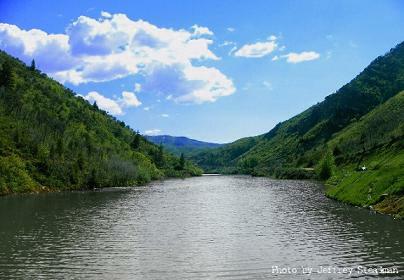 Causey Reservoir is an intermediate-sized reservoir on the South Fork of the Ogden River above Huntsville. It is located east of Ogden in Ogden Canyon. It is one of the most scenic and beautiful reservoirs in Utah. The reservoir is nestled in steep valley terrain. The reservoir extends away from the main body into 3 distinct canyons. The majority of the shoreline is administered by the U.S. forest service, but	access is limited due to private ownership at key access areas which restricts access to the area except by existing waterways. The majority of the shoreline is privately owned, however there is a public boat ramp facility. CLOSED to the possession of kokanee salmon with any red color from August 15 through September 29. CLOSED January 1 through 6 a.m. on the second Saturday of July (July 8). CLOSED August 15 through September 29.